Press TV talks with Lizzie Phelan, journalist and political activist, in London who has been to Libya and says that Western media is complicit in war crimes in the North African country through omission of fact and that the vast majority of the population are in support of the Libyan government. Following is a transcript of the interview. Press TV: NATO has issued an apology for a strike. They have blamed “technical error” on a publicized NATO strike that has killed civilians. The conclusion we can draw from that is, if it happened it may happen again, which relates to the risk of more civilian casualties. Concerning this air campaign, do you think it has actually gone too far when it is not saving lives? Phelan: Yet again we are seeing what the U.S. and Europe shamefully call collateral damage in the form of human lives, like we have seen previously in Iraq and Afghanistan and in many other parts of the world. This apology by NATO is an absolute joke. It’s the first apology we’ve had from them in the three months despite the fact that civilians have been dying at the hands of NATO airstrikes every day in this time. In the past three months there have been thousands of strikes on the country, so they make the apology on Sunday, June 19, but at 2 a.m. the following morning there was another attack on the city of Sorman, 130 km west of Tripoli, where a further 15 civilians and three children were killed. In previous weeks we have seen the bombing of al-Nasr University in Tripoli in the daytime where civilians were killed. These are the “military targets” that we’re seeing them bomb. We’re seeing them bomb Friday market street in Tripoli, where there is no nearby military site. Friday market street – I’ve been there; it begins with a post office and ends with a primary school, and they bombed four buildings and killed nine civilians, including a toddler of four-months old. So, we are seeing what “humanitarian intervention” and the “protection of civilians” according to NATO means – i.e., the killing of children. Press TV: The NATO apology concerns its responsibility for the deaths of nine civilians and 18 injured in an early morning strike at an apartment building. In terms of what NATO is exercising, it does put into question the goals of NATO on the ground. Also, this comes when there are CIA officers and covert operators, as has been reported, that are on the ground, in touch with the revolutionaries. Phelan: I wouldn’t call anybody who is inviting NATO, the CIA or intelligence services into their country revolutionaries. They are in fact counter-revolutionaries. The purpose is clear and that is to curb the Arab Spring. But it goes back further than that, since the revolution – i.e., military coup of 1969-70 – when Qaddafi kicked out the British and the Americans, closed their military bases and nationalized the oil. The West has had an agenda since then to get back into Libya and take complete control of the oil resources. Yes, they’ve had a period of rapprochement with Libya whereby they have been able to make some good deals but they haven’t had anywhere near the kind of control that they would like to have ‒ like they have in Saudi Arabia, Qatar or the other Gulf states which are, effectively, client regimes. So the agenda is clear: To completely violate international law and assassinate Qaddafi against the will of the Libyan people without ever actually asking them what it is that they, themselves, want. I wouldn’t call anybody who is inviting NATO, the CIA or intelligence services into their country revolutionaries. They are in fact counter-revolutionaries. Press TV: Since you have visited Libya, what is the support that Muammar Qaddafi has and what is going on in terms of the tribal allegiance that exists there? Because, as we understand, there has been a split along traditional tribal lines and animosity has existed. Also, based on some research done, this split has indeed been funded by the West. Phelan: Exactly. Just on Friday (June 17) there was a complete blackout in the media except for one CNN report about a march of 1 million Libyans, in a country of 6 million people, in Tripoli towards Green Square in support of the government and also in support of the people of Benghazi and Misrata who are being harassed and persecuted by what I call counter-revolutionaries, which is what others call rebels, in particular Black Libyans who, because of the shameful story that Al Jazeera has pumped out about Qaddafi hiring African mercenaries, are being lynched publicly in places like Misrata and Benghazi. I have met refugees from these areas who are victims of these atrocities, the most unspeakable of which are being committed against them by pro-NATO counter-revolutionaries. In terms of the tribes in Libya, my sources bear information that 90 percent are supportive of the government, including the largest tribe in Libya. Of course, before the uprising there were frustrations In Libya as there are within every single country. But the Libyan people are an extremely non-confrontational people who will go to the ends of the earth to resolve issues in a non-confrontational way. I have met Black refugees from Misrata and Benghazi who are victims of atrocities, the most unspeakable of which are being committed against them by pro-NATO counter-revolutionaries. And that is also reflected in the government in the way in which they have tried over the decades, bending backwards to accommodate opposition forces within the government, which in a sense has backfired as we saw from the people who defected from the government and who sold out because they were in the pockets of the CIA, MI6 and other Western intelligence services. So, from my experience in Libya the support for the government is absolutely widespread. There was a Guardian journalist in Libya who, thankfully, was deported for reporting that the reason there is no opposition in Tripoli is because there are informers everywhere. 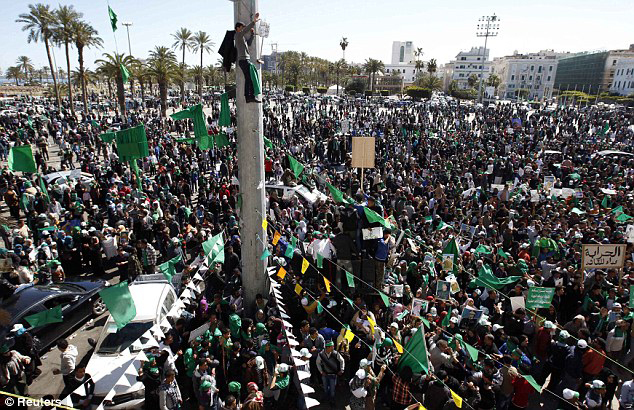 A million people marched through the streets of Tripoli, so the people have spoken for themselves. Press TV: When will a political solution be discussed? Is NATO going to be ready to face the fact that there has to be a political solution in Libya? Many officials in the U.S. have talked about having a political solution in Afghanistan and have conceded that for any war this is the best way forward. So why is this military bombing continuing in Libya? Phelan: I have no faith in NATO to ever have the humility to suggest that what is needed and what was needed from the outset is a political solution. It’s clear that NATO has no way at the moment to get out. They have gone into this war and they can’t lose face now. I want to quickly mention something that has not been or rarely gets mentioned: The sanctions imposed on Libya have now led to a crisis in the country whereby people have to queue for six days for food and fuel and we’ve seen the impact from that in Iraq. Sanctions are one of the greatest killers, sometimes more so than outright military war. They killed millions of people in Iraq. Coming back to your question, I would say that the U.N. has been acting as an extension of NATO and has done so in Libya. Press TV: I have said that NATO is the armed wing of the U.N. in which the U.N. is used and then of course NATO comes in and we see how that gets exercised when it comes to various countries. Phelan: I would say it the other way around. The U.N. is essentially a wing of NATO in the sense that it gives legitimacy to what NATO’s agenda is. And I have no faith in either of these institutions to deliver any kind of political solution in the country. The U.N. has proved itself a failure since the War on Terror began and even before then. Lizzie Phelan, aka Lizzie Cocker, was in Tripoli at the time of the Dignity mission led by former Congresswoman Cynthia McKinney. This interview first appeared on PressTV. One million???? Where did you get that count from, from Gaddafi's criminal inner circle?? Investigate a little more and see how many of those were paid or forced to show up with green flags. It's a shame you are serving as a mouthpiece for one of the bloodiest dictatorship in the world. Now, go on and report on the massive pro-democracy rallies in Benghazi, Misrata and many other places! Even while grad misiles by Gaddafi's thugs landing near by! Shame on you! Whatever the numbers were in Tripoli, they were HUGE and those huge numbers contradict the lie that Gadhafi lacks the support of ordinary Libyan citizens. As for the "mass" rallies in support of the CIA, NATO sponsored rebels, there were only "tens of thousands" that came out in Bengahzi which has a population of over half a million people! That is a massive FAIL! FACT: If Gadhafi didn't have the support and backing of his people in the face of the terrorist NATO alliance, he would have been overrun a long time ago.. But NO… he and his people are still holding strong after 4 months of constant bombing by the most power military alliance on the planet! FACT: If the CIA & NATO were not propping up and bombing on behalf of their friendly rebel pawns, they would have all fled Libya way back in March. Have you not heard that a million or so firearms were distributed among the people ? "Speaking for Libya’s 2000 tribes, the Council issued a Proclamation signed by scores of tribal leaders from eastern Libya."